In the spirit of October’s Healthy Living Theme, the entire body will be in the limelight. LOL. Don’t miss Friday’s post! Time management at its finest. Just like most females who endure that yearly gynecological wellness check, which may or may not be another sip of the Kool-Aid that we’ve been conditioned to believe is essential for good health and cancer detection, I too brave the silvery stirrups every twelve moons or so, although at my advanced #midlife status, it’s acceptable to wait a couple of years between these physically invasive exams. My pre-check routine is to bathe and shave (this might be oversharing, but I don’t wax ‘cos I’m allergic to it and I really have an aversion to strangers hanging around “down there”) and make myself and my lady parts as camera-ready as possible. I gotta comment on the feelings of being post-menopausal and sitting in the same waiting room with full-to-bursting, fecund, FERTILE women. It doesn’t feel very good. To be past — as in beyond — childbearing age. It’s not that I want to have another baby even if I could– I’m no Michelle Duggar — the truth is that I only wanted one perfect child (which I have), but to be sitting amongst those who still have functional baby makers made me feel kind of dried up and old. I wanna pull up my shirt and pull my pants down just enough to proudly display my C-section scar, those battle wounds, my daily reminder of the painjoypainjoy I endured to become a mom, which is all I ever really wanted to be when I grew up. Screw it. The solution should be separate waiting rooms. I can’t deal with the assault of fruitfulness slapping my aridity in the face. Just like we all have to do whether we are the elite or the hoi polloi or even Kim Kardashian or Kate Middleton, I changed into the most unflattering shade of pure and blinding white scratchy paper gown with the narrow plastic belt/tie/thingy. The great equalizer. It was barely long enough to execute a proper bow. Or maybe it was a hairband? Now I’m not sure. Whatev. Is white paper the new black? The new orange? Nope. It’s still nothing that will ever be trendy or urban chic. Great, the next step is the inelegant hop up on the also white paper-covered exam/lounging table. I must admit I’ve become so spoiled by 800-thread count sheets that I was quite offended by the scratchy but slippery texture. At least it’s sterile — and that pleases my OCD. The doc finally sauntered in with a pleasant smile and bouncy hair, switching on that godforsaken bright light that serves to highlight each and every darling cellulite dimple that I’ve accumulated over the last few decades. ILOVEMYCELLULITEILOVEMYCELLULITE. NOPE. SERIOUSLY. I HATE MY CELLULITE. “How often do you do a self-exam breast check?” Doctor Z asked as she was doing just that. “Never” I said, with my most winsome smile. “There really isn’t enough there to check…” She laughed at my little attempt at levity to lighten the atmosphere while she’s kneading and pinching and probably thinking about what she’s going to be drinking later on that evening — anyway, that’s what I was doing. White wine? No. Pinot Noir? No. Straight vodka from the bottle? Winner, winner, winner! Ignominy. That’s the only way to describe it. A Pap smear, also called a Pap test, is a procedure to test for cervical cancer in women by collecting cells from the cervix. That first involves the insertion of an instrument of torture called a speculum. 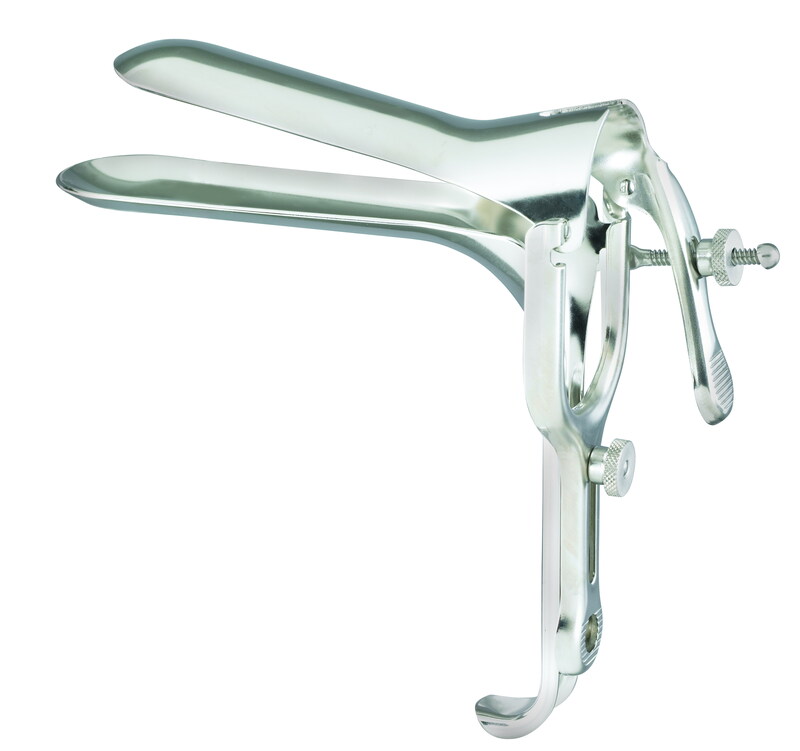 FYI, the modern speculum was invented (by a man, of course) in 1845. I can share with you after having gone through about a dozen gynos over the years, Doctor Z is the BEST. And I prefer a woman gyn. I don’t think a man can understand what our issues are, no matter what. Only a woman knows what another woman feels and experiences. Doc Z has perfected a painless method of scraping the cervix and she’s never accidentally pinched that very sensitive area that makes you want to convulsively kick their faces across the room. FYI, that’s the real reason why the have those little wheeled stools so they can roll away FAST before they get punched out by a valiant v-jayjay. The most dreaded part of the exam is over; time to stuff the paper gown in the trash and get dressed. But this visit’s not quite over because Dr. Z has joined the ranks of a new breed of doctor; combining a medical specialty with the value added option of a little cosmetic rejuvenation in the form of Botox and fillers. Ergo the Pap smear and Botox. I consider it my reward for enduring the humiliation of exposing my inner workings. While we chat about being vegan and a new vegan restaurant in Encinitas called #Native Foods, Doc Z prepares the botulism that will be injected into my face; to paralyze the correct muscles and stem the flow of aging — if only for a few brief months. Maybe I can no longer have babies growing in my belly –but my glass is still half full; I no longer have to worry about “that time of the month” and my empty nest (and womb) affords me the opportunity for a little well deserved pampering. Do you have a male of female doc?